The USA Patriot Act, the law granting the government vast surveillance powers that was adopted in the wake of September 11, turns a decade old Wednesday. But despite its namesake of “United and Strengthening America by Providing Appropriate Tools Required to Intercept and Obstruct Terrorism,” the law seemingly is being invoked far more to target domestic crime than for fighting terrorism. The act, which has remained largely the same since President George W. Bush signed the legislation six weeks after 9/11, among other things gives the government powers to acquire phone, banking and other records via the power of a so-called “national security letter,” which does not require a court warrant. National security letters, perhaps the most invasive facet of the law, are written demands from the FBI that compel internet service providers, financial institutions and others to hand over confidential records about their customers, such as subscriber information, phone numbers and e-mail addresses, and arguably websites you have visited. The FBI need merely assert, in writing, that the information is “relevant” to an ongoing terrorism or national security investigation. Nearly everyone who gets a national security letter is prohibited from even disclosing that they’ve received one (the automatic gag order provision was struck down in a rare legal loss for the Patriot Act, but they persist in practice). More than 200,000 letters have been issued by the FBI. Amendments requiring that the letters seek data relevant to a “terror” investigation have failed. A decade after Bush’s signature, information is sketchy about how the law is being used in practice. For instance, Sen. Ron Wyden (D-Oregon) claims the government applies a far broader, and classified legal interpretation of the Patriot Act. Wyden says he “can’t answer” any specific questions about how the government thinks it can use the Patriot Act. That would risk revealing classified information, he said. There have been plenty of Inspector General reports published about the act. Some point to government abuse of it, and others highlight that the Patriot Act is often invoked for reasons unrelated to terrorism. One report shows that of the 143,000 national security letters issued between 2003-2005, the FBI said it referred 53 cases for prosecution. (.pdf) None were for terrorism. 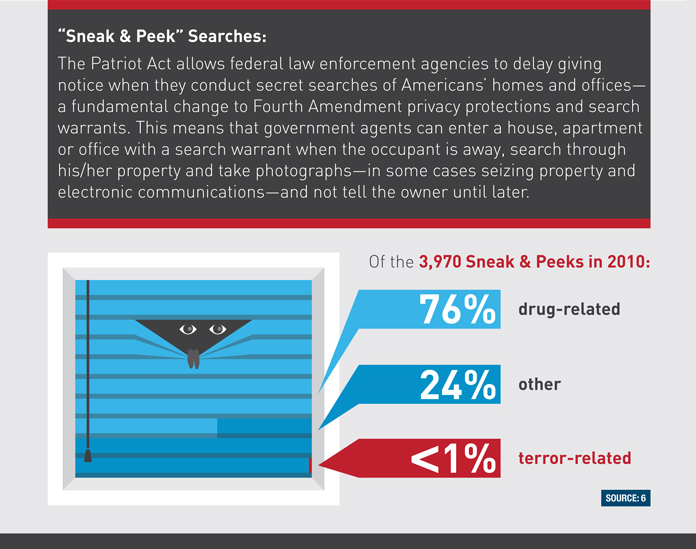 The law also grants so-called “black bag” or “sneak and peek” searches in which the authorities may delay notifying a property owner that an area has been searched. In 2010, less than 1 percent of the 3,970 such searches were terror-related. About 76 percent were drug-related. Another Inspector General report showed in 2007 that the FBI evaded limits on, and sometimes illegally issued, national security letters for phone, e-mail and financial information on American citizens and underreported the use of these self-issued orders to Congress. Congress’ only response has been to leave the law virtually unchanged. Many members of the Senate Judiciary Committee in 2009 said they’d been privately briefed by intelligence officials who were worried that adding constitutional protections for Americans could place the public in harm’s way and jeopardize ongoing investigations. So the committee reauthorized three controversial measures of the Patriot Act that were expiring. That wouldn’t be the last time Congress had punted. In May, for example, Congress reauthorized those same three provisions that again were expiring. The “roving wiretap” provision allows the FBI to obtain wiretaps from a secret intelligence court, known as the FISA court (under the Foreign Intelligence Surveillance Act), without identifying the target or what method of communication is to be tapped. The “lone wolf” measure allows FISA court warrants for the electronic monitoring of a person for any reason — even without showing that the suspect is an agent of a foreign power or a terrorist. The government has said it has never invoked that provision, but the Obama administration said it wanted to retain the authority to do so. The “business records” provision allows FISA court warrants for any type of record, from banking to library to medical, without the government having to declare that the information sought is connected to a terrorism or espionage investigation. The expiring measures originally were set to sunset in December 2009. Congress extended the deadline until the end of February 2010 in a bid to work out compromise legislation. When that failed, lawmakers punted for a year. Then in February of this year, Congress declared that those measures would expire at the end of May unless new action was taken. Lawmakers took the long view, and extended the provisions until June 1, 2015. Happy birthday, United and Strengthening America by Providing Appropriate Tools Required to Intercept and Obstruct Terrorism Act.